When we began growing jalapenos a few years ago, we investigated making our own chipotles, which are simply smoked jalapenos. We haven’t tried it yet, though we have a smoker now and and might give it a go this year depending on how good the harvest is. In Mexico the process takes several days, and I’m not sure if we could safely keep the coals burning that long with our three boys running around, so we’ll have to figure out the safety angle, too. In the meantime, we purchase chipotles in adobo sauce, which are nothing short of a magical ingredient in my book. These smoked peppers are then cooked and stored in a sauce made from tomatoes, vinegar, garlic, salt, and spices, and they add an incredible smoky, spicy flavor to foods. They have become widely available in recent years and there are several brands sold in the U.S., such as La Costeña, La Morena, San Marcos, and others. We only use one or two chipotles at a time because we’ve found that they can be wicked little things, so we always put the remaining chipotles in a small container and keep them in the freezer for later. They keep well for several months. 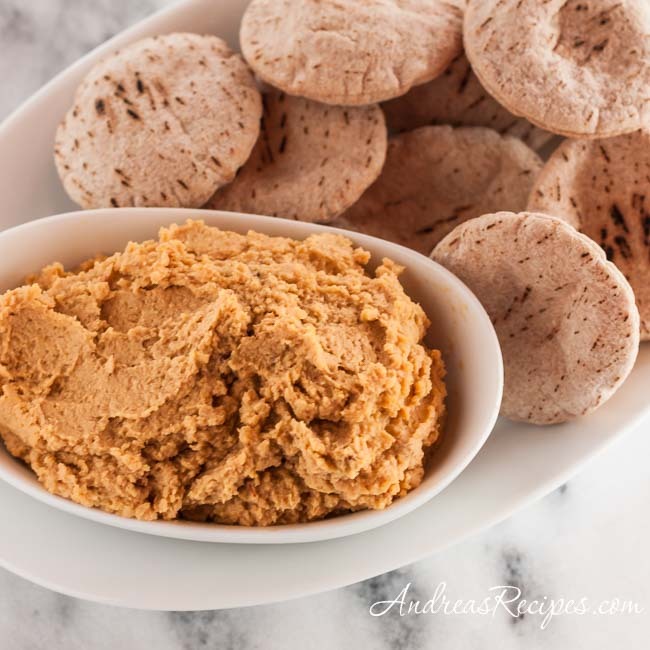 Hummus is a staple around our house, and for years I’ve used it as a condiment on sandwiches rather than mayonnaise or mustard. I’ll slather it in a whole wheat pita or on a whole wheat bagel, then add alfalfa sprouts and sliced avocado, and I’ve got lunch. 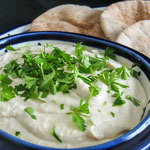 And of course we also use it as an appetizer with pita chips and fresh vegetables. 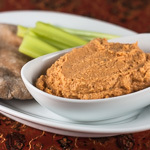 This spicy hummus recipe is one of Michael’s favorites. In the bowl of the food processor, add the beans, tahini, lemon juice, and garlic. Process for a few seconds to get the mixture started, then add the chipotle pepper and adobo sauce (optional). While the processor runs, begin drizzling in the olive oil, starting with 2 tablespoons, adding more as necessary to create a smooth paste. Process about 3 to 5 minutes for best texture. 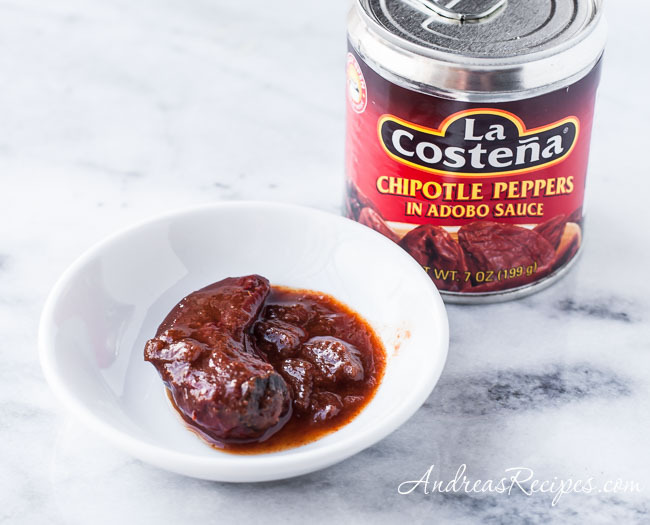 I have been looking for new ways to use up those chipotles in adobo. thanks! Oh, yummy! Gonna try this, too! Goodness, you’re keeping me busy! This sounds really good. A few years ago I started using the ground dried chipotle powder instead of the canned ones, just another way to get that great flavor. I will be very impressed if you smoke your own! This sounds really good. 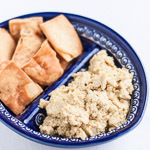 I’m a hummus addict, but haven’t *quite* mastered my own yet. Getting there! we seem to have the same addiction… i love the smokiness of chipotle, it’s one of my all-time-favourite spices/condiments! i put it in everything… but haven’t tried it in hoummus yes… this is going straight on my to-do list!